Their orders are to pass in between the left side of the village and the steep hill and pierce the Austrian lines! At the same time the Austrians have cleared everything in front of their left infantry wing and are ready to march towards the village! Although the village is attacked from two sides, its defenders hold with success. The Irish and Swiss make two attacks to throw the Grenzers out of the woods. The Grenzers evade and come back. With a last push, the French have secured the ridge, you may hear their Hurrah (last pic) Salis Swiss regiment painted by Tony Lymb. 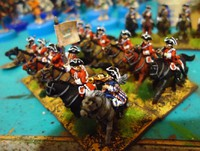 The Bercheny hussars cause many hits to an Austrian dragoon regiment and the right Austrian cavalry wing brigade is done for. One good infantry brigade (the Germans), a dragoon cavalry brigade and two chevauleger regiments. 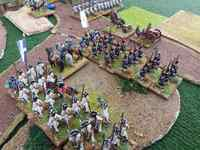 The Austrian lost a smaller cavalry brigade, one small grenadier battalion and two artillery batteries. A winning draw for the Austrians. That's just a superb battle. I admired all the spendid French units and the colourfull flags etc..
Nice to see your agressive attacks. Did you rated the French cavalry (except dragoons and maison du roi) inferior completely? I rate them Standard for charges. That gives them some chance to win melees if they have enough of supporting units if they have enough luck in the first round of melee. That is one of the best battles I saw for a long time. Why was it a draw? The French were not broken, I suppose, and if they just had to occupy the hills and the village, they won, even if their losses were too high. It's always a pleasure to have such a very different counterpart. 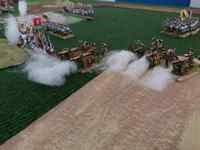 And it's interesting to see how he used his artillery in a massive battery. I could not emagine how you should destroy the battery to turn off the artillery fire. You managed very fine to hold the village. Perhaps you had some success by activation of reinforcements? It is always very encouraging to hear so good words from a most experienced HoW player! I always like to test new rules to the limits, and besides that I wanted to see how my French army could fare under bad odds. I rated all French cavalry as inferior in all aspects (e.g. two hits when passed through, unable to recover hit when at 15cm proximity etc) except fro the big Schomberg Dragoon regiment which I rated standard and all the Maison du Roi which I rated superior. I have read so many controversial things about the behavior of French cavalry, that I am quite puzzled. I intend to raise some questions at the Discussions Section, as how to rate French cavalry under different periods (WSS, WAS, SYW) and what could be some ideal and historically acceptable proportions between inferior standard and superior cavalry units. We played about 8 or 9 rounds and it was a bit late, so when Greg gave his hand and proposed a draw, I accepted it, it was a gentleman's agreement! The truth is that I devised the scenario on the spot, so I gave him tooooo much artillery, eight batteries, two of them heavy. I promise next time not to make such a mistake! Anyway, by infantry charges I managed to capture two of the ones that were posted near the village. 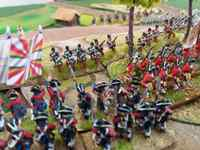 At the start I put two standard battalions, Condé and Angoumois to defend the village and when Condé received 3 hits, I pulled it at a safe place at the back of the village to recover. 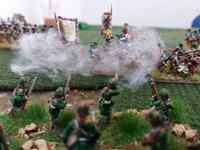 My elite brigade of Grenadiers Royaux and Grenadiers du Roi was approaching, so I think I could hold the village as long as needed. It was a massive battle with many units close to each other, so I have to add that I received quite many hits from grazing fire. But all what actually happened, I think that it was quite realistic, it was part of Fog of War, never your plans can be executed to perfection! P.S. 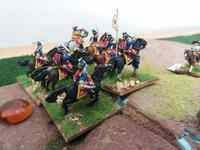 For the French cavalry a long talk is needed. Cheers! 8 to 9 turns is a word! For such a large battle I would recommend to use a limit of turns. Maybe you will note, that I mostly give such a Limit because we play in my flat only and there we have only a short time to play, if I'm not so fortunate to send my kids to the grandparents or something like that. If that is not possible, we just play from 22:00 to 0:00 on a saturday evening. I and my friends just need a satisfying result. Sometimes the battle ends in a draw if both sides don't achieve the victoryconditions. All French cavalry as inferior is a good decision. I just feared that this would everybody (except me) annoy and than nobody would like to play the French. For such a large battle I would recommend to use a limit of turns. Maybe you will note, that I mostly give such a Limit because we play in my flat only and there we have only a short time to play, if I'm not so fortunate to send my kids to the grandparents or something like that. If that is not possible, we just play from 22:00 to 0:00 on a saturday evening. I and my friends just need a satisfying result. Sometimes the battle ends in a draw if both sides don't achieve the victory conditions. Sorry, I was editing while you were replying, so you might re-read the final text. Yes, I fully understand your strict time limits, this is why I appreciate your short scenarios, we as well do not have always 4 hours of gaming time at our disposal, such as for this battle. But what is in favor of these rules is that although the number of units was quite big, we had a very smooth game flow. Cuirassiers du Roi, Gendarmes Ecossais and another unit of Gendarmes.